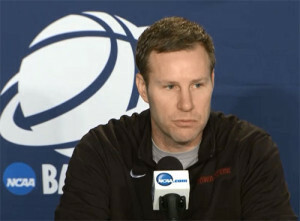 Fred Hoiberg answers questions after NCAA loss in March. A news release from Iowa State university says men’s basketball head coach Fred Hoiberg underwent successful open heart surgery to replace his aortic valve on today (Friday) at the Mayo Clinic in Rochester, Minnesota. The Hoiberg family would like to thank the many individuals who have prayed for Fred and shared their support as well as the medical staff at the Mayo Clinic.